SPACEPORT NEWS Feb. 21, 2003 Page 2 Recognizing Our PeopleWayne Hale new launch integration manager Veteran NASA Flight Director Wayne Hale has been named Space Shuttle Launch Integration manager stationed at the Kennedy Space Center. Hale replaces Astronaut Jim Halsell, who has begun training as commander of Space Shuttle mission STS-120. Space Shuttle Program Integration Manager Linda Ham served as acting Space Shuttle Launch Integration manager through the launch of Space Shuttle mission STS-107 and will continue in that role until Hale assumes full duties. The Space Shuttle Launch Integration manager oversees all launch preparations and has the final responsibility for a go or no-go decision at each Shuttle liftoff. Wayne is the most experienced ascent and entry flight director at NASA and will bring tremendous talent and expertise to his new post, said Space Shuttle Program Manager Ron Dittemore. Hale began his career at NASA in 1978 as a flight controller in JSC's Propulsion Systems Section. He served as a propulsion officer for 10 Shuttle missions, beginning with STS-2. He went on to head the Integrated Communications Section in Mission Operations and the Propulsion Systems Section before being named a Space Shuttle Flight Director in 1988. He has served as an ascent and entry flight director for 28 shuttle missions, most recently for mission STS-113 in November. He also has served as a lead flight director for three Space Shuttle flights. Hale has a bachelor of science in mechanical engineering from Rice University and a master of science in mechanical engineering from Purdue University.WelcomeJames Kennedy, the new deputy director of Kennedy Space Center was honored with a welcome reception at the Doubletree Oceanfront Hotel Cocoa Beach on Jan. 21. The reception, was sponsored in part by the Florida Space Business Roundtable, the Economic Development Commission, the National Space Club, the Boeing Co., Lockheed Martin and United Space Alliance.The Space Shuttle Launch Integration Manager oversees all launch preparations and has the final responsibility for a go or no-go decision at each Shuttle liftoff.Kennedy Space Centers new Space Shuttle launch integration manager is Wayne Hale, formerly a NASA flight director. SPACEPORT NEWS Page 3 Feb. 21, 2003AIAA hosts propulsion seminar at BCC Future space propulsion technologies and those for current launchers were presented at the Brevard Community College Planetarium in Cocoa Feb. 15. This Space Propulsion Symposium was organized by the Cape Canaveral Section of the American Institute of Aeronautics and Astronautics (AIAA). Cape AIAA President Doug Wright said that the purpose of the symposium was twofold: We wanted to serve our membership and offer a technical program that is a benefit to them. We also wanted to offer a program that is of value to local students so that they can get a better understanding of real-world engineering problems and how to go about solving them. The Cape Section includes chapters at Embry-Riddle and Florida Institute of Technology. Lockheed Martins Ed Christiansen discussed the Russian RD-180 engine used for Lockheed Martins Atlas III and V. He noted that the related RD-170 engine is rated for manned spaceflight, which could have implications for NASAs orbital space plane program. Six other lectures focused on emerging technologies. NASA Marshall Space Flight Center sent Dr. Mike Houts, who spoke on space fission propulsion and power, and J. Boise Pearson discussed solar thermal propulsion. Pratt and Whitney personnel gave three lectures. Russell Joyner told about nuclear hybrid propulsion and power; Robert Faulkner addressed hypersonic airbreathing propulsion; and Chris Hagger summarized propulsion research for the Integrated Space Transportation Plan. With recent events, the orbital space plane concept is getting more attention, Hagger said. Dr. John Brandenburg of the Florida Space Institute closed the symposium with his work on the Microwave Electro-Thermal Thruster. For more information about the program, visit www.CapeAIAA.org Spaceport Technology Development Contract awarded to ASRC Aerospace Corp.NASA finalizes contract with USANASA's Kennedy Space Center (KSC), Fla., has awarded the University-affiliated Spaceport Technology Development Contract (USTDC) to the ASRC Aerospace Corporation of Greenbelt, Md. The contract is a cost-plus award fee/incentive fee performancebased indefinite delivery/indefinite quantity (ID/IQ) contract. The contract features a four-year, seven-month basic period of performance beginning March 1 with five one-year options for a potential nine-year seven-month contract term. The basic contract's estimated cost is $220 million with a potential value of $600 million over the entire period inclusive of the five oneyear options. Under the contract, ASRC NASA has settled negotiations that increase the value of a twoyear extension of the Space Flight Operations Contract (SFOC) held by United Space Alliance, LLC, in Houston, by $59.91 million. NASA's exercising of the two-year SFOC extension, which supports the Space Shuttle Program, was previously announced in August 2002 with negotiations continuing. This final agreement on price, terms, conditions and scope of work for the contract, through Sept. 30, 2004, brings the total value of the two-year contract extension to $2.90 billion. The SFOC is NASA's prime contract for support of the Space Shuttle and provides operations services for the International Space Station. The effort under this contract entails the provision of space flight operations including all work necessary and appropriate to support scheduled space flight missions through the two-year period. This is a cost reimbursement contract with award fee, incentive fee and performance fees. The principal places of performance of work under this contract are United Space Alliance facilities in Houston; Huntsville, Ala.; and the Kennedy Space Center; and major subcontractor facilities in Huntington Beach, Calif.; Houston; and Cape Canaveral. Aerospace, along with their USTDC partners; Swales Aerospace, Beltsville, Md. ; Sierra Lobo, Inc., Milan, Ohio; and the University of Florida, Gainesville, will provide non-routine engineering development products and services to operational customers performing processing, launch, landing, and range activities at KSC. ASRC will perform applied research and development functions to meet future technology challenges. The work will be performed at KSC and at NASA facilities located on Cape Canaveral Air Force Station, Fla. ASRC Aerospace is a wholly owned subsidiary of the Artic Slope Research Corporation, Barrow, Alaska.Hazardous weather information available What is the No. 1 weather killer in Florida? When do we have our worst tornadoes? How do you handle rip currents? The Florida Hazardous Weather Awareness Week-2003 was held Feb. 16 through 22. Full details and education information are available at www.floridadisaster.org/hwa03/ home.htm. Weather safety training is also available from the 45th Weather Squadron at 853-8410. Each day of the Florida Hazardous Weather Awareness Week featured a particular weather hazard in our state. The most immediate weather threat to the Space Coast is tornadoes. Our strong tornado season slowly rises in February, peaks in late March, and then falls in April. The largest tornado outbreak in Florida history was February 1998. However, the past several years have had reduced tornado activity and people may have become complacent  especially new arrivals that have never seen one of our tornado outbreaks. This year, we may see a return to more severe winter weather due to the moderate El Nino in the Pacific Ocean. If you havent already, now is the time to prepare for this late winterspring strong tornado season. These tornadoes often occur late at night, so be prepared to hear the warning sirens at any hour. Better yet, since not all areas have sirens, or you may not hear the sirens when deep in sleep, buy a NOAA weather radio that will sound an alarm if the National Weather Service issues a warning for your area. Feb. 21, 2003 SPACEPORT NEWS Page 6COLUMBIA ...(Continued from Page 1)warmed his listeners with his open appreciation for the difficult role that they play as educators of the next generation of explorers. The Florida League of Teachers was organized in 1993 by the Florida Department of Education, Division of Human Resource Development to establish a vehicle for engaging some of Floridas most outstanding teachers in statewide implementation of school improvement and accountability. The major work of League teachers is modeling, training, facilitating and coaching to promote other teachers continual improvement in the instructional setting. League members serve as demonstration teachers, coaches and facilitators. KSC was honored that this organization chose Brevard County as the site to celebrate this milestone, Biegert said. Were always glad to have the opportunity to help teachers inspire the next generation of engineers and scientists. The NASA/KSC Education Division, the Educator Resource Center (ERC) and the Aerospace Education Services Program (AESP) put together an exciting day of events including viewing the newly released Space Station IMAX film, an educational tour of the Space Center and interdisciplinary math and science activities. The leagues dedication to improving the quality of learning for all students and empowering teachers to meet the challenges in our schools and educational system as a whole is greatly appreciated.TEACHERS ...(Continued from Page 1)Former Astronaut Charlie Walker shares his experiences with members of the Florida League of Teachers. The grid on which the pieces of Columbia debris will be organized is captured in this aerial view of the RLV Hangar floor. The debris has begun arriving at KSC from the collection point at Barksdale Air Force Base, Shreveport, La. As part of the ongoing investigation into the tragic accident that claimed Columbia and her crew of seven, workers will attempt to reconstruct the orbiter inside the RLV.Feb. 12 Governor Jeb Bush voted for his favorite Florida quarter design, kicking off the beginning of a three-week Internet voting period. Governor Bush will be reaching out to Floridas teachers, school children, residents and visitors alike to take part in choosing one of five designs to grace the back of the Florida quarter. The Americas Spaceport, featuring a Space Shuttle superimposed over an outline of the state and surrounded by 27 stars signifying Florida as the 27th state admitted to the Union is sure to be a popular design with Kennedy Space Center workers as will Gateway to Discovery, which highlights Floridas past with a Spanish galleon and Floridas future with a rendering of a Space Shuttle. The voting period will end on March 5 at 9:30 a.m. The public will be able to cast their votes by visiting the states www.myflorida.com Web site. Residents who do not have access to a computer can still cast their votes by using computers and Internet services that are available free of charge at their local libraries. Votes can also be mailed to the Governors Office of Citizen Services, The Capitol, Tallahassee, Florida 32399. The design that captures the most votes will be submitted to the United States Mint for circulation. More than 1,500 designs were submitted, but only five designs were selected by the Florida Commemorative Quarter Committee and forwarded to the Mint. The Mint is expected to circulate the Florida quarter in spring 2004.Florida quarter might feature Shuttle the Solid Rocket Booster (SRB) Disassembly Facility and tour of the SRB assembly and refurbishment facilities. Members visited the Launch Control Center and Launch Pad 39A, where Columbia was launched. Retired Navy Admiral Harold Gehman, CAIB chairman, spoke briefly with news media representatives. He said the CAIB wants to look at four things at KSC: launch procedures; Shuttle refurbishment between flights; the Columbia mishap reconstruction site; and be sure in our own minds the process here for Columbia reconstruction meets our investigatory needs. The efforts will take place in the Reusable Launch Vehicle Hangar located adjacent to the Space Shuttle runway at KSC. SPACEPORT NEWS Feb. 21, 2003 Page 7Stennis engineer recommends flexibile attitude One NASAEDITORS NOTE: This is the first in a series of stories from the various NASA centers on the One NASA concept. Since coming to work for NASA in 1995, engineer Karen Vander has seen the basis for the One NASA ideals at work every day. As the executive secretary for the Rocket Propulsion Test Management Board (RPTMB), NASAs decision-making body for the agencys rocket propulsion testing, Vander provides the daily coordination of the board composed of NASA staff members from White Sands Test Facility, Las Cruces, N.M.; Marshall Space Flight Center, Huntsville, Ala.; Glenn Research Center  Plum Brook Station, Sandusky, Ohio; and Stennis Space Center, Hancock County, Miss. Vander believes the team approach used by the RPTMB is an example of what can work for the whole agency. The management board is the One NASA concept, she said. The board works openly in an atmosphere of trust. Everyone has a say, but the goal is to find the best match of assets for propulsion test programs. Administrator Sean OKeefe introduced the One NASA concept in December 2002 by asking employees to help shape the effort through their thoughts and ideas. One NASA will require each employee to consider all decisions within the context of what is best for the agency rather than for any one organization. Mr. OKeefes support will help the agency achieve the One NASA goal, said Vander. With his leadership and his knowledge of federal administration, theres no limit to what we can accomplish. Although Vander sees One NASA ideals at work daily, she says the initiative can be fully realized only through hard work and cooperation. Were doing it now, said Vander. We just have to strengthen what we have. We have to continue to find ways to do our jobs better. We have to work as a team. Part of achieving the One NASA goals will mean overcoming oldfashioned, center-centric ideas. Even though we sit in different states or come from different places, were still one organization, and we should work that way, said Vander. What center we come from should be nearly invisible. We all need to be working toward a common goal to meet NASAs mission. The NASA community can help further One NASA, said Vander, by being flexible. Were going through a lot of changes now. But as long as the communication lines keep flowing, thats going to help. As One NASA ideals improve interagency cooperation, Vander noted, the practice will also benefit the agency in its interactions with other federal organizations. Were building relationships, Vander said. We have to build on our commonalities to strengthen the agency. Karen has risen to meet every challenge we have put in front of her, said NASAs Mike Dawson, assistant director, Stennis Space Center, who has seen Vander put the One NASA values to work to benefit NASA and its relationships with other federal agencies. She is currently leading the development efforts of a system to accurately and efficiently track high-valued rocket propulsion test components to be used in new propulsion system designs and existing propulsion facilities throughout NASA and the Department of Defense. Vander is an engineer in the Propulsion Test Program Office at Stennis Space Center. Her husband, Maury, is also a NASA engineer.Sea turtles releasedStennis Space Center engineer Karen Vander is a believer in the One NASA concept. A large sea turtle with a transmitter is released into the Mosquito Lagoon. It is one of several turtles found stunned, impacted by the unseasonal cold temperatures experienced in Central Florida. The cooperative effort of KSC contractor Dynamac Corp.s Aquatics Program and the Merritt Island National Wildlife Refuge warmed the turtles and evaluated them for release. Most were tagged and the largest one received a transmitter, provided by the University of Central Florida, for satellite tracking. The turtles were then transported through the Haulover Canal to a location away from the main channel for release. 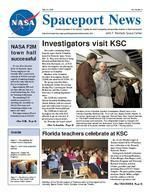 Page 8 SPACEPORT NEWS Feb. 21, 2003 John F. Kennedy Space Center Managing editor. . . . . . . . . . . . . . . . . . . Bruce Buckingham Editor. . . . . . . . . . . . . . . . . . . . . . . . . . Kathy Hagood Editorial support provided by InDyne Inc. Writers Group. NASA at KSC is located on the Internet at http://www.ksc.nasa.gov USGPO: 733-133/600026Spaceport News Spaceport News is an official publication of the Kennedy Space Center and is published on alternate Fridays by External Relations and Business Development in the interest of KSC civil service and contractor employees. Contributions are welcome and should be submitted two weeks before publication to the Media Services Branch, XAE-1. E-mail submissions can be sent to Katharine.Hagood-1@ksc.nasa.gov Remembering Our HeritageBy 1960, Hughes, RCA and AT&T were urging NASA to develop a different type of communications satellite. Hughes believed that geosynchronous satellites, which orbit Earth 22,300 miles (35,900 km) above the ground, offered the best location because the high orbit allowed the satellites orbital speed to match the rotation speed of Earth and therefore remain essentially stable over the same spot. With the Defense Departments active support, NASA offered Hughes a sole-source contract to develop an experimental geosynchronous satellite, which it called Syncom. Only 17 months after Goddard Space Flight Center awarded the contract, NASA launched Syncom I, Feb. 14, 1963, but it stopped sending signals a few seconds before it reached its final orbit. Five months later, NASA then launched Syncom II, which demonstrated the viability of the system. The third Syncom transmitted live coverage of the Olympic games in Tokyo to stations in North America and Europe.Syncom I launches Feb. 14, 1963F2M ...(Continued from Page 1)Freedom to Manage (F2M). The F2M Task Force, led by NASAs Chief of Staff and White House Liaison Courtney Stadd, ended its Agencywide town hall meeting tour measures such as changing rules, regulations, and procedures  whatever it takes to make NASA efficient, effective and accountable. KSC Center Director Roy Bridges encouraged active F2M participation. The purpose of F2M is grand and sweeping. It enables managers to do better jobs and allows members of the team to do their jobs more effectively. Without good ideas we wont get much out of this, he said. Specifically, F2M focus areas are human resources, procurement, financial management, intellectual property and external relations and at KSC. The purpose of the meetings were to discuss ideas that help attain F2Ms goals of eliminating the restrictions, delays, micro reviews and obstacles to managing work in a dynamic environment, while still maintaining high productivity and high quality. There are no excuses for being apathetic after the Task Forces visit, as F2M offers an outlet (http: //f2m.nasa.gov/) for all NASA employees to submit questions, comments and suggestions, and more importantly receive responses. Contributing to F2M helps the Agency identify and remove performance barriers. This includes other miscellaneous areas of concern. Respective representatives described each focus area, and the Internet procedures for submitting and tracking F2M inputs were also explained. After the initial F2M introduction and forum, break out sessions were held in different Headquarters Building rooms to discuss the focus categories in depth. Due to restricted seating, directors invited a limited number of employees to participate based on their job responsibilities and areas of expertise. Stadd emphasized the importance of the workforces opinions to the overall success of the effort. Right now, we have 671 inputs. Were trying different approaches to deal with them all, he said. The only way to know were doing this right is through feedback. He also explained the need to break down barriers. We cant continue doing things one way, just because thats the way weve always done it.F2M program participants (Ieft to right) were Dennis Griffin, executive secretary F2M Task Force at NASA Headquarters (HQ); Cou rtney Stadd, NASA chief of staff and White House liaison, co-chair F2M Task Force; Roy Bridges, KSC director; Rich Wickman, energy coordinator, Environmental Management Division, Office of Management Systems, HQ; Patrick Ciganer, special assistant to the administrator for Financial M anagement, HQ; Anne Guenther, director of the Analysis Division, Office of Procurement, HQ; and Greg Hayes, director of Human Resources, Johns on Space Center.